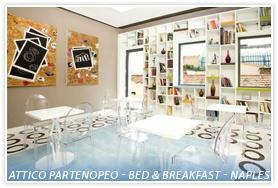 Attico Partenopeo B&B Naples. Bed and Breakfast Attico Partenopeo, Naples. Relais Attico Partenopeo offers a new philosophy of hosting guests that come to Naples to discover its glamour and beauty. In the heart of the city, just a few steps from the historic center, near the most famous monuments and shopping, the hotel offers a warm welcome surrounding guests by a private, intimate surroundings, that offers a great view and all the imaginable comforts. Just as you walk through the door, the large windows and welcoming reception area, with a large book case, will immediately put guests at ease. The comfortable rooms offer all the smallest detail and the most modern conveniences. We aim to please you. Our attentive and professional staff is happy to help you with planning excursions by boat around the gulf of Naples, assist you with an itinerary to explore the historic attractions, or to reserve a place for dinner in an exclusive restaurant in the city. Attico Partenopeo: a luxurious vacation in the cool, heart of Naples.